The "wonder material" could help billions of people around the world access safe drinking water. A new product made of graphene makes it possible to easily and cheaply make dirty water potable. The “wonder material” technology could be used to significantly boost the availability of clean drinking water to developing parts of the world. 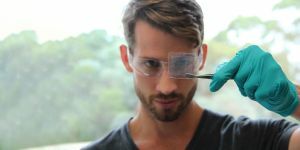 Scientists from Australia’s Commonwealth Scientific and Industrial Research Organisation (CSIRO) developed a thin membrane made of graphene, called “Graphair,” which can make dirty water clean enough to drink after just a single pass through. The team’s research was published in Nature Communications. The World Health Organization (WHO) has compiled some frightening statistics regarding worldwide access to clean water: according to that data, at least 2 billion people around the world are using drinking water contaminated with feces. The consumption of contaminated drinking water can transmit a number of diarrheal diseases, such as cholera, dysentery, typhoid, and polio, as well as many parasites, like giardia. In water-stressed areas that also have limited access to medical care, diarrheal illnesses can be life-threatening. According to WHO data, around 502,000 people die each year from these illnesses after drinking contaminated water — and many of them are children. Current methods of water filtration are expensive and time-consuming. Graphair doesn’t just make it easier to get clean water, it’s also more affordable than other kinds of graphene. It also manages to be both easy to use and relatively inexpensive while retaining the highly beneficial properties of the material. In fact, the material’s primary component is renewable soybean oil. One of the material’s most desirable properties is that it is hydrophobic, meaning it repels water. The material was developed to have microscopic nanochannels that allow water molecules through the film but are too small for pollutants comprised of larger molecules to get through. The end result is a completely clean water sample after just one pass through the film. The next steps for the team will be to connect with industry partners who can help them scale Graphair up for practical use. They’re also looking to conduct field tests for the material’s efficacy in real-world conditions. In a press release, lead author Dong Han Seo said “All that’s needed is heat, our graphene, a membrane filter and a small water pump. We’re hoping to commence field trials in a developing world community next year.” If they’re able to meet that goal, Graphair could soon become an integral part of municipal filtration systems while also bringing clean water to the parts of the world which need it most.